Stylize your home with Aarsun Royal Handcrafted Wooden Dining Set. Dining set is an important part of home and this is the one place where the whole family comes together to have dinner and spend some time together. This elegant traditionally handcrafted 8 seater Wooden Dining Set consists of 8 chairs and a Dinner Table. 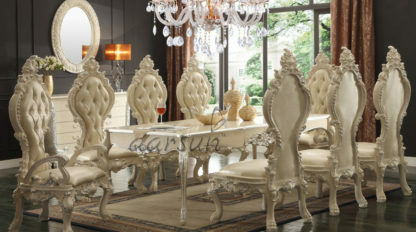 The Dining table has a dual support heavy base with floral carvings and braided designs at the sides of the table top. The dining set is made from premium quality Teak Wood (Sagwan / Sagaun / Sevan) with dark walnut finish. 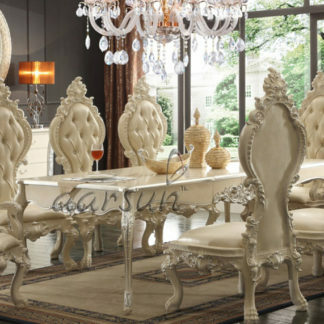 The dining chairs has carvings similar to the dining table and elegant curves. The dining chairs are also made in teak wood with fine vintage style upholstery. The overall look and feel of the unit makes it a center of art. The Wooden Dining Set can have 6 family members and friends seated comfortably together enjoying their meals. In terms of caring, the dining set can be easily wiped cleaned using a good quality cotton cloth. The dining set is durable enough to withstand extreme temperatures, thanks to the Teak Wood used which is practically termite resistant due to natural oils. The most fascinating thing about the furniture sets offered by Aarsun Woods is that they are highly customizable. 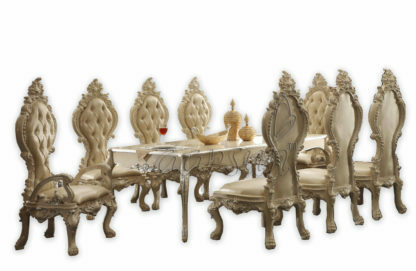 The Royal Dining set can be customized to your desire. The material, the design and the size can be made exactly as per your requirement. Contact us for exact delivery time frames and other details. We have a number of designs in Wooden Dining Set. As we are the manufacturers, each sofa can be specifically made as per your home requirements.